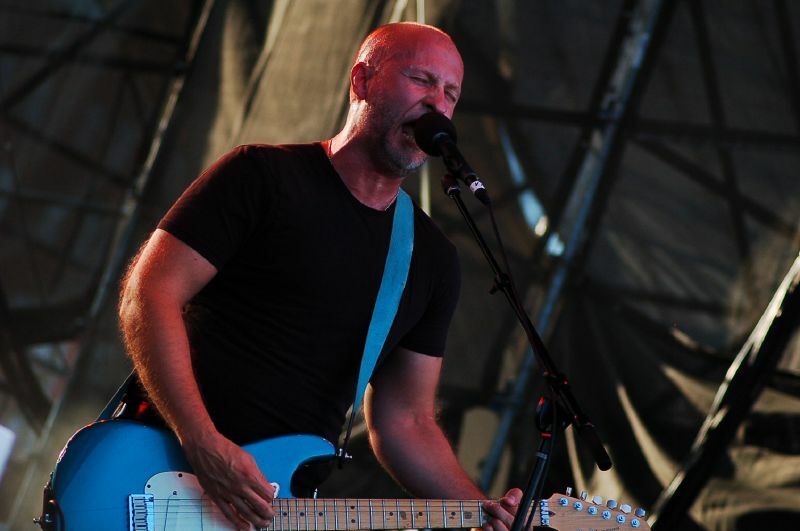 Image: “Bob Mould of Husker Du, Sugar” by angelo Yap is licensed under CC BY 2.0. Bob Mould continues his winning streak of great solo albums with “Sunshine Rock,” his fourth album for Merge Records. Mould’s music has typically dealt in the umbrella-realm of melancholia. One of the pioneers of alternative rock with his first band, Husker Du, he wrote tracks now considered indie rock standards, such as “Makes No Sense At All,” and “Could You Be The One.” These tracks deal with dissatisfaction and confusion with the way certain people behave or portray themselves. He continued these themes to even greater acclaim in the 90s with his second band, Sugar, with tracks like “The Act We Act” and “Believe What You’re Saying,” tracks that deal largely with similar frustrations to that of his songs with Husker Du. Ever since Sugar broke-up, Mould has remained a solo act, toying around with different styles to embellish his already established pop-meets-loud rock sound. His experimental efforts have proven to turn off the majority of his fan base until a tribute concert featuring the likes of Dave Grohl, Ryan Adams and No Age at Disney Hall in Los Angeles reminded Mould of the true value his most devout fans saw in his music. It was at this show that Mould announced the upcoming release of 2012’s “Silver Age,” what was to be his first record for Merge Records. “Silver Age” saw Mould in a sort of renaissance — deriving the sound that he yielded best: distorted, frantic pop rock with a melancholy twist. Lyrically, his string of records for Merge has switched from a frustration of others to a frustration over himself. 2016’s album “Patch the Sky” marks the peak of these themes. However, despite his consistent partiality towards frantic tempos, “Sunshine Rock” is a noticeably upbeat record for Mould. The guitars are brighter, the lyrics reflect contentment with problems and love for others, and there are even orchestral arrangements to be heard on this record. The title track opens the record, with a propulsive beat provided by Jon Wurster, an energetic drumming veteran of the indie scene. Gorgeous string arrangements back the wall of sound guitar tone Mould is famous for, as he belts about a spending the day with a partner he so passionately loves. Following is the track “What Do You Want Me To Do?” — a track dealing in frustration over an assumed argument with a love interest, perhaps a family member. This frustration translates both through his scorching guitar performance and strained vocals. The tracks “Sunny Love Song” and “The Final Years” both deal with Mould’s coming to terms with his homosexuality, and his move to Berlin ­— a city where he feels more welcomed for who he truly is. He describes his sorrow and problems fading away, and no longer feels enraged as a result. This is the fourth record of Mould’s so called ‘renaissance,’ but this record seems to mark a renaissance for himself feeling completely comfortable in his own skin, living in an inclusive space, all the while making the music he has always loved to make. “The Final Years” sees a change of pace with the album musically, with clean, chorused guitars and a slower tempo than previously heard on the record. “Sin King,” perhaps my favorite track on the record, reminds me much of “Voices In My Head,” from “Patch The Sky.” The chord progression and tempo of “Sin King” recalls that song, which remains one of my favorite Bob Mould songs of all time. The slow, lumbering tempo helps the guitars seem more atmospheric than usual, a feat that was unfathomable to me until just now. The lyrics read as a metaphor of his dissatisfaction with living in America, the title referring to our current president. I love how tasteful of a protest song this is. Shrouded in figurative language, one can easily derive the true meaning behind the song. It is as immediate as Bob’s sharp sense of pop songwriting. “Camp Sunshine” is another clean guitar track on the record, acting as a nice palette cleanser from the in-your-face nature of the majority of the tracks here. Curiously, the track features no drums at all, which is rare for a Bob Mould record. The record closes with “Western Sunset,” another track dealing with Mould’s new life in Berlin. The vocal harmonies and sharp melodies of this song remind me of artists like The Move and Nick Lowe, comparisons that I would never have previously made with Bob Mould, and yet the song still stands as one of the best on “Sunshine Rock”. Overall, Bob Mould remains on a long streak of great albums he has put out, now in its seventh year. The songs delve into more complex structures, happier themes like self-actualization and turning over a new leaf, and a brighter sound to accompany those themes. As a fan of Bob’s for over six years now, it is wonderful to see him in a better place than he was even a couple of years ago. No one enjoys suffering through hardships, even if it means yielding amazing artwork. However, some artists have the idea that true art is only derived from suffering. Luckily, with this new record, Bob Mould has proven that his fans do not have to worry about that.